Figure 1: Graph of corrected-average readings (OD 450 nm) plotted for standard curve samples. Read validation report #028773 for application ELISA. Table 1: ELISA. IL-6 is present in the positive control sample (human serum) and absent from the negative control sample (mouse brain). Spike controls indicate no interference in absorbance readings from the protein lysate buffer used to prepare the protein extracts. 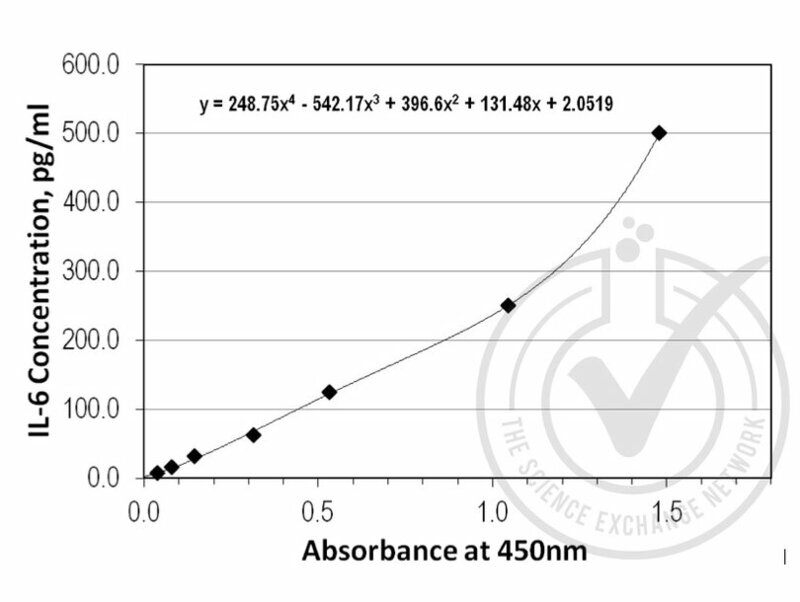 Absorbance readings (OD 450 nm) are shown for standard curve, spike controls and unknown positive and negative control samples. 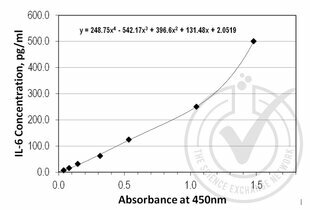 The absorbance of all the samples including standards, spike controls and unknown samples were measured at 450 and 540 nm and the absorbance values at 540 nm were subtracted from those at 450 nm to account for optical imperfections in the ELISA plate. 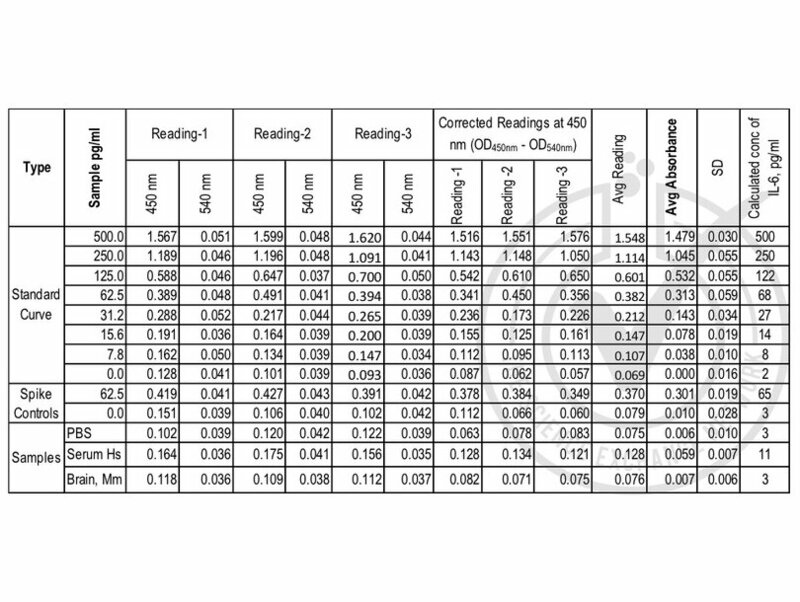 Value for Average Reading is derived from the average of three corrected-readings (OD 450nm). 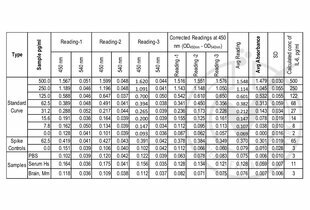 The Average Reading for 0 ng/ml Standard was subtracted from all Average Readings to yield Average Absorbance values for standards, spike controls and unknown samples. 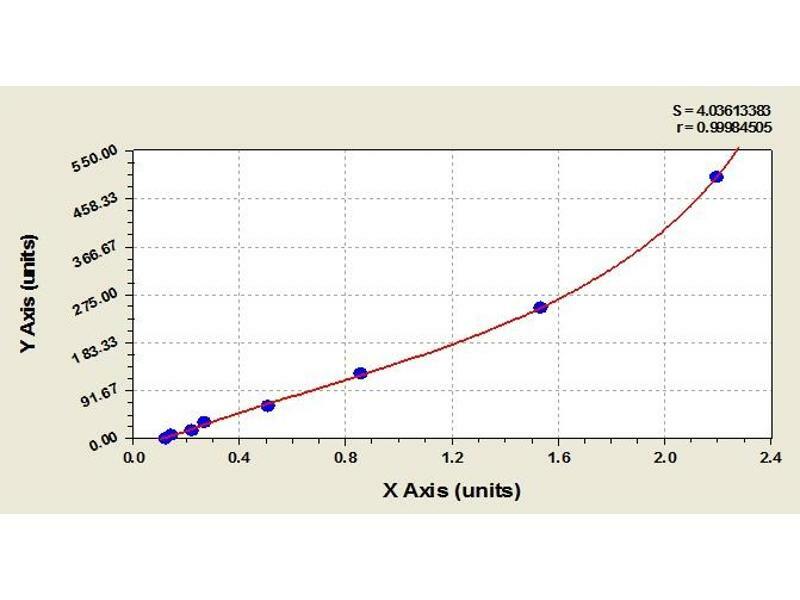 Standard deviation is included for all samples. Standard curve was generated by regression analysis with four-parameter logistic. An equation (y = 248.75x4 - 542.17x3 + 396.6x2 + 131.48x + 2.0519) was derived from the standard curve and used to calculate IL-6 concentrations shown in the Table. Notes Signal was detected in positive control samples but not in negative control samples. was prepared by Alamo Laboratories. generated from the standard provided in the kit using sample diluent buffer. Spike control: standard diluted in PBS [62.5 and 0 pg/mL]. liquid from each well was aspirated but wells were not washed. 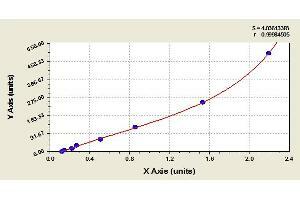 100 µL of Biotin-antibody (1x) was added to each well and the plate was incubated for 1 h at 37°C. (1X) each time x 2 min. 100 µL of HRP-avidin (1x) was added to each well and the plate was incubated for 1 h at 37°C. 90 µL of TMB Substrate was added to each well and the plate was incubated for 25 min at 37°C. well was measured at 450 nm and 540 nm within 5 min using a microplate reader. 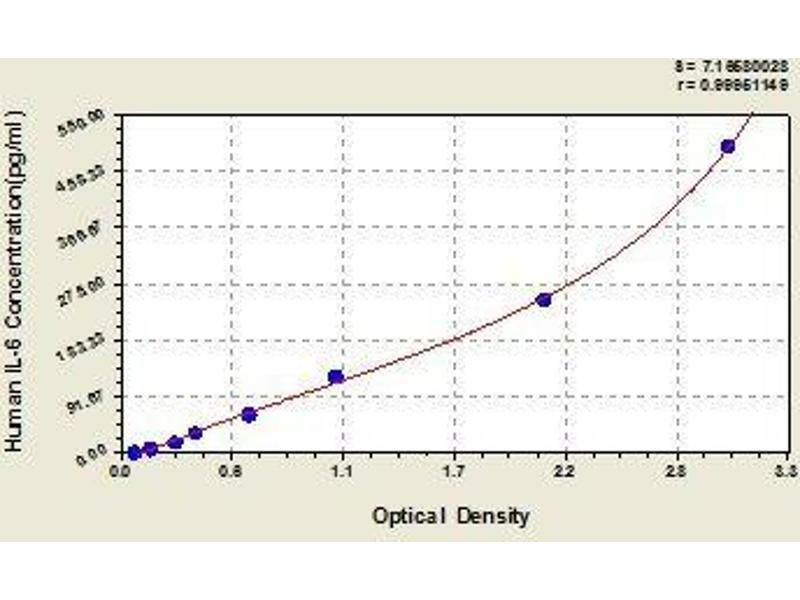 curve and used to calculate IL-6 concentrations based on their Average Absorbance values. Purpose For the quantitative determination of human interleukin 6 (IL-6) concentrations in serum, plasma, cell culture supernates, tissue homogenates and urine. 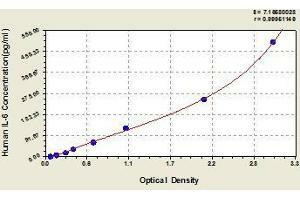 Specificity This assay has high sensitivity and excellent specificity for detection of human IL-6. Protocol This assay employs the quantitative sandwich enzyme immunoassay technique. Antibody specific for IL-6 has been pre-coated onto a microplate. 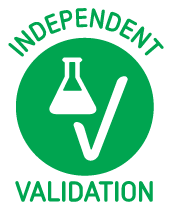 Standards and samples are pipetted into the wells and any IL-6 present is bound by the immobilized antibody. After removing any unbound substances, a biotin-conjugated antibody specific for IL-6 is added to the wells. After washing, avidin conjugated Horseradish Peroxidase (HRP) is added to the wells. Following a wash to remove any unbound avidin-enzyme reagent, a substrate solution is added to the wells and color develops in proportion to the amount of IL-6 bound in the initial step. The color development is stopped and the intensity of the color is measured. Product cited in: Yang, Yu, Dong, Zhang, Du, Zhu, Che, Wang, Shen, Jiang: "Serum macrophage migration inhibitory factor concentrations correlate with prognosis of traumatic brain injury." in: Clinica chimica acta; international journal of clinical chemistry, Vol. 469, pp. 99-104, 2018 (PubMed). Yu, Huang, Po, Tan, Wang, Zhou, Meng, Yuan, Zhou, Li, Wang, Wang, Jiang: "Low-Level Tragus Stimulation for the Treatment of Ischemia and Reperfusion Injury in Patients With ST-Segment Elevation Myocardial Infarction: A Proof-of-Concept Study." in: JACC. Cardiovascular interventions, Vol. 10, Issue 15, pp. 1511-1520, 2018 (PubMed). Chen, Cheng, Shao, Shentu, Fu: "Macrophage migration inhibitory factor as a serum prognostic marker in patients with aneurysmal subarachnoid hemorrhage." in: Clinica chimica acta; international journal of clinical chemistry, Vol. 473, pp. 60-64, 2018 (PubMed). Wang, Yan, Peng, Jiang, He, Peng, Chen, Ye, Zhuo: "Functional Role of SUV39H1 in Human Renal Tubular Epithelial Cells Under High-glucose Ambiance." in: Inflammation, Vol. 41, Issue 1, pp. 1-10, 2018 (PubMed). Golkhalkhali, Rajandram, Paliany, Ho, Wan Ishak, Johari, Chin: "Strain-specific probiotic (microbial cell preparation) and omega-3 fatty acid in modulating quality of life and inflammatory markers in colorectal cancer patients: a randomized controlled trial." in: Asia-Pacific journal of clinical oncology, Vol. 14, Issue 3, pp. 179-191, 2018 (PubMed). Liu, Liu, Feng, Xiao: "Kinin B1 receptor as a novel, prognostic progression biomarker for carotid atherosclerotic plaques." in: Molecular medicine reports, Vol. 16, Issue 6, pp. 8930-8936, 2018 (PubMed). Weeratunga, Herath, Kim, Lee, Kim, Lee, Lee, Chathuranga, Chathuranga, Yang, Ma, Lee: "Dense Granule Protein-7 (GRA-7) of Toxoplasma gondii inhibits viral replication in vitro and in vivo." in: Journal of microbiology (Seoul, Korea), Vol. 55, Issue 11, pp. 909-917, 2018 (PubMed). Zhu, Jia, Luo, Wang: "Polyriboinosinic-polyribocytidylic acid facilitates interleukin-6, and interleukin-8 secretion in human dermal fibroblasts via the JAK/STAT3 and p38 MAPK signal transduction pathways." in: Cytokine, Vol. 102, pp. 1-6, 2018 (PubMed). Bi, Wang, Wang, Sun, Dong, Meng, Li: "Selenium inhibits Staphylococcus aureus-induced inflammation by suppressing the activation of the NF-κB and MAPK signalling pathways in RAW264.7 macrophages." in: European journal of pharmacology, Vol. 780, pp. 159-65, 2017 (PubMed). Guan, Chen, Zuo, Guo, Peng, Wang, Yin, Li: "Contrast Media-Induced Renal Inflammation Is Mediated Through HMGB1 and Its Receptors in Human Tubular Cells." in: DNA and cell biology, Vol. 36, Issue 1, pp. 67-76, 2017 (PubMed). Yu, Li, Deng, Yu, Luo, Sun: "Synovial fluid concentrations of cold-inducible RNA-binding protein are associated with severity in knee osteoarthritis." in: Clinica chimica acta; international journal of clinical chemistry, Vol. 464, pp. 44-49, 2017 (PubMed). Mao, Cao, Wang, Wang, Chen, Wang, Xing, Ren, Lv, Dong, Chen, Chen, Wang, Yan: "The Salutary Influence of Forest Bathing on Elderly Patients with Chronic Heart Failure." in: International journal of environmental research and public health, Vol. 14, Issue 4, 2017 (PubMed). Xiao, Gong, Chen, Yu, Wang, Zhang, Dou, Liu, Cheng, Lu, Yuan, Li, Zhao: "IL-6 promotes epithelial-to-mesenchymal transition of human peritoneal mesothelial cells possibly through the JAK2/STAT3 signaling pathway." in: American journal of physiology. Renal physiology, Vol. 313, Issue 2, pp. F310-F318, 2017 (PubMed). Li, Qiu, Li, Chen, Zhu, Chai: "Assessment of the hemolysis and endothelial cell cytotoxicity induced by residual linear alkylbenzene sulfonates on pharmaceutical rubber stoppers based on HPLC-ESI-MS." in: Biomedical chromatography : BMC, 2015 (PubMed). Ambreen, Ismail, Qureshi: "Association of gene polymorphism with serum levels of inflammatory and angiogenic factors in Pakistani patients with age-related macular degeneration." in: Molecular vision, Vol. 21, pp. 985-99, 2015 (PubMed). Guo, Jiang, Tang, Si, Jiao: "The association of serum vascular endothelial growth factor and ferritin in diabetic microvascular disease." in: Diabetes technology & therapeutics, Vol. 16, Issue 4, pp. 224-34, 2014 (PubMed). Chen, Xu, Chen, Chen, Zhang, Ren, Xu: "Effect of oridonin-mediated hallmark changes on inflammatory pathways in human pancreatic cancer (BxPC-3) cells." in: World journal of gastroenterology : WJG, Vol. 20, Issue 40, pp. 14895-903, 2014 (PubMed). Cheng, Zhong, Xiang, Zeng, Cai, Zhao: "Soluble receptor for advanced glycation end products in critically ill patients and its associations with other clinical markers and 28-day mortality." in: Clinical interventions in aging, Vol. 9, pp. 1981-6, 2014 (PubMed). Qu, Wang, Deng, Wei, Deng: "Associations between longer habitual day napping and non-alcoholic fatty liver disease in an elderly Chinese population." in: PLoS ONE, Vol. 9, Issue 8, pp. e105583, 2014 (PubMed). Jiang, Tang, Guo, Jiao: "The role of insulin-like growth factor I and hypoxia inducible factor 1α in vascular endothelial growth factor expression in type 2 diabetes." in: Annals of clinical and laboratory science, Vol. 43, Issue 1, pp. 37-44, 2013 (PubMed).